A beautiful clifftop venue with breathtaking views of Cala Tarida. 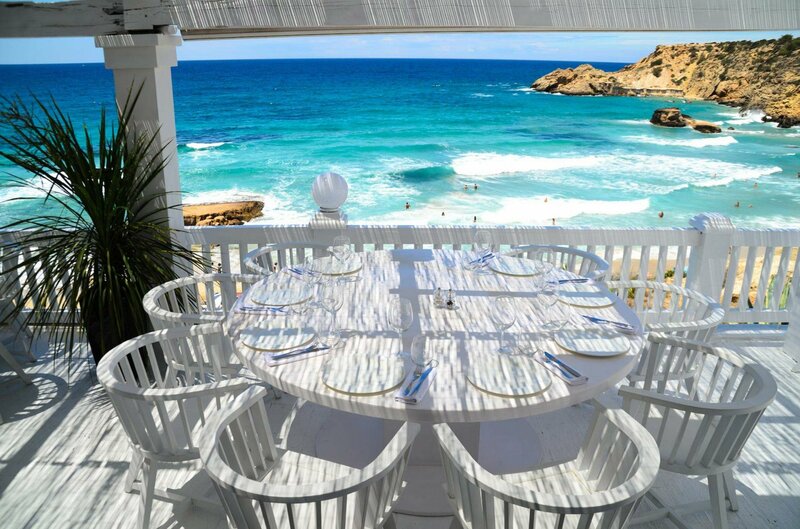 A traditionally whitewashed slice of perfection dropped atop the cliffs overlooking the beautiful Cala Tarida on Ibiza's southwest coast, Cotton Beach Club is one of the premier locations to enjoy Ibiza's much loved sunsets, a delicious lunch or a quick cocktail. All material within the venue is 100% cotton, hence the name, and the design is stunning. White woods, metals, materials... everywhere, which makes for a beautiful image when set against blue and aqua hues of the sea and sky in the background. Chic furnishings and stylish day beds, if you visit the Cotton Beach Club you can be assured of a relaxing experience filled with great music, excellent food and refreshing drinks. The restaurant offers a wide variety of dishes to suit all tastes. Fish, of course, hamburgers, pasta, meats and of course, amazing desserts. In an effort to constantly improve food service, members of the team often take trips around the world to look for inspiration, and this is reflected in the food and wine menus. Not that you needed an excuse to visit Cala Tarida, but surely with the addition of Cotton Beach Club now you have plenty of reasons to tick this one off your Ibiza 'to do' list.